The original Airman was developed in close cooperation with pilots of civil and military aviation. Featuring 24 hour numbers, 5 minute numbers and a minute/ seconds scale and with a rotating bezel for a second timezone, it is also well known for its “hacking seconds”. This means that when you pull the crown out on the Airman, the seconds hand will tick along and stop at 12, allowing for greater accuracy/ synchronisation. With the exception of the period of 1990-1998, which was a period of dormancy, the Airman’s modern variants continue to be a mainstay of their production, although many of the characteristics of the “old Airmans”, such as the mineral domed crystal and “cross hatched” crown in particular, are no longer there. 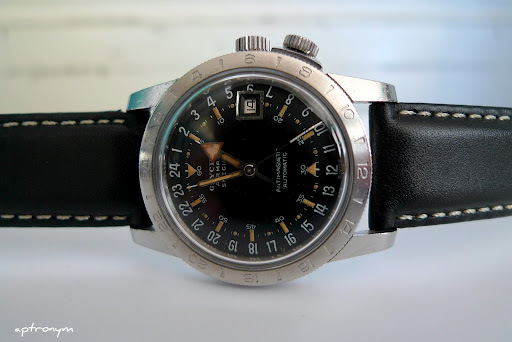 This model is a Glycine Airman Special (there were both “Glycine Airman” and “Glycine Airman Special” models) with an automatic Felsa 692 movement, which puts it in the 1953 – 1960 range of production. I was told by the dealer that my model is from circa 1958. It has the black date indicator rather than the red one, and a working hacking seconds. I admit that my first choice had been for a red date indicator (and a cross hatched crown), but in the end, this watch was priced too attractively to pass. As you can see, this one has definitely been “well loved”. 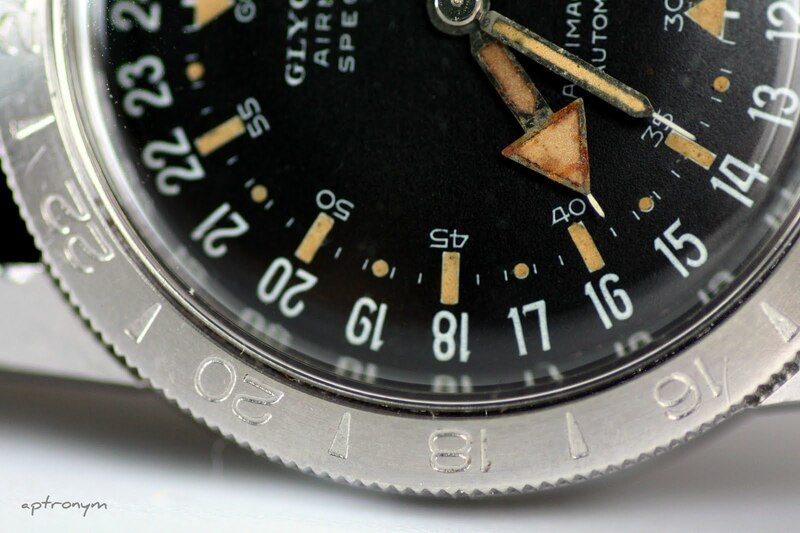 Dings, bezel numbers faded and the hands showing discolouration. I had the hands checked, and was told that the rust is stable and will not get worse, so they have been left “as is”. At 36mm, this is a small watch by modern standards, and some of the modern Airman iterations have been much larger than this, though there is 38mm version currently available. It came on a NATO strap, which I know that many people like, but although it looked quite good, as I am not much of a NATO person, I bought a leather Glycine strap, which I find more attractive and more versatile. I don’t remember what it was about the Airman that first attracted me to it, but despite having bought this not only sight unseen (there were photos on the website) but also without having previously seen a vintage Airman in the flesh, there was always going to be the risk that the connection would not be there once I received it. Happily, this has not been the case. For all its dings, the chip on the lug, the state of the hands and the fading of the bezel numbers, this is a watch that I have fallen in love with. It has personal character along with the history, sits comfortably on my wrist and, after the first week or so of being a bit disconcerted by having to remember that it’s a 24-hour watch, is actually a lot of fun time-reading wise, as well. 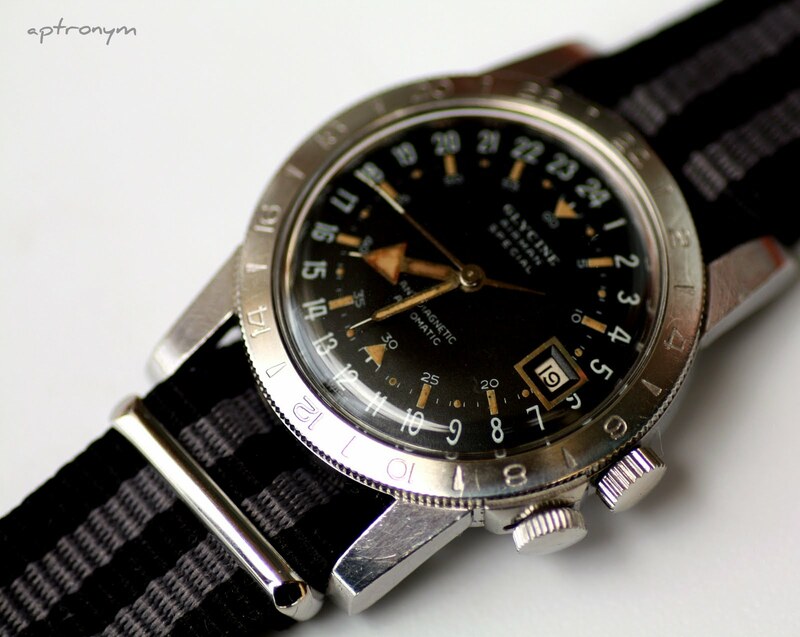 A final thought – Modern Airmans cost more than vintage ones, so why would you choose to get one of the former? Believe it or not, the original strap was an unpadded lizard strap. Fix-O-Flex bracelets were also offered. 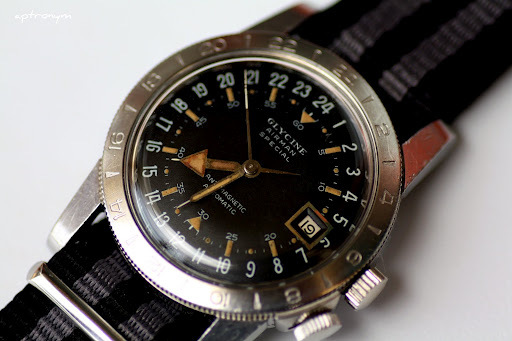 By the end of the 60s, the bracelets wore the Glycine name. the first bracelets were stretch bracelets with no clasp. By the end of the 60s they were deployment bracelets. 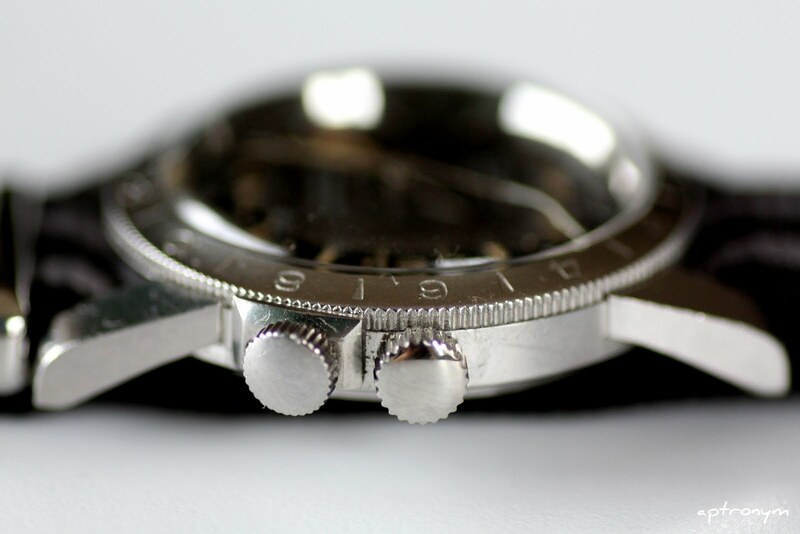 If the back of your watch is a screwback, then the movement should be a Felsa, and the date indicator should be red. There should be no cross hatch crown. 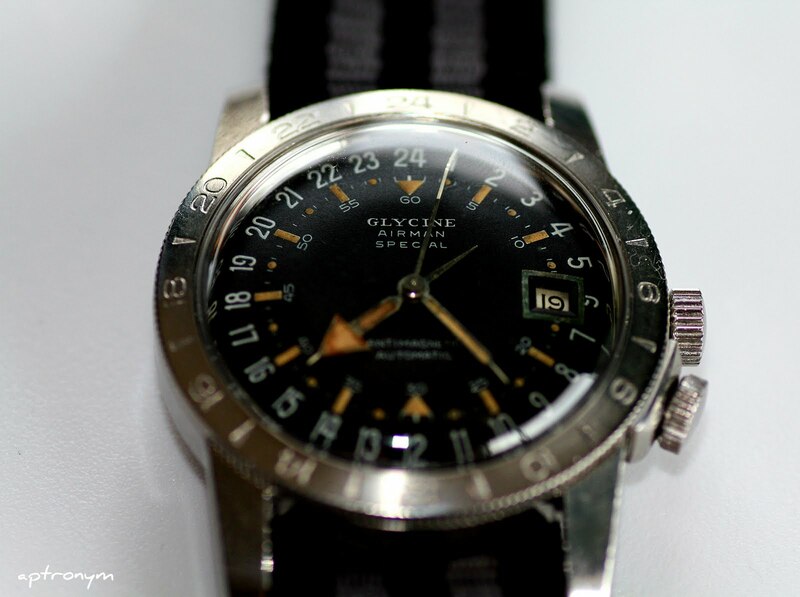 If you have a compressor back, you should have an A.Schild movement and a black date and a cross hatch crown. There may well have been other straps available, and they may have been different at different times. I was fortunate enough to grab an unworn late 60s Airman, with its original signed lizard strap. Thanks for finding my new blog and for your comments. My Airman is tucked away at the moment so I’ll dig it out and get back to you about whether it’s a screwback. The movement details that I wrote were provided by the dealer that I purchased it from. Would love to see your Airman with its original strap. There are screw back cases with A. Schild caliber 1700/01 movements. They are not nearly as common as the screw back case with the Felsa caliber 692 movements, but they do exist. They would have been produced circa 1964. I just saw this post. There were indeed a few of these examples. I asked /Werner about them when I discovered that the Felsa movement wouldn’t fit them a few years ago, and the cases are slightly different from the cases made for the Felsa movements. My recollection (its been a couple of years) is that the few I have seen also have black dates, unlike the red date with the Felsa movements. They were a transition case which actually puts them at about 1960. My recollection is that they did not have cross hatch crowns.